Stow Lake is a manmade lake in Golden Gate Park with a rich history that dates back to 1893. The lake has provided San Franciscans with an outdoor escape for more than a century, as they come to enjoy the scenery and allure of the city. Offering hiking and bike trails, Stow Lake is a popular destination for visitors looking to engage in active pursuits in the park. A lazy Sunday afternoon may include a rowboat ride across the waters. Weekend picnicking, wildlife viewing, and even ghost hunting are also favorite endeavors of park visitors. If you are a San Francisco local and frequent Golden Gate Park, floating or paddling about Stow Lake at least once in your lifetime is a must. Creating endless memories, those who rent a row boat, electric boat or pedal boat from the Stow Lake Boathouse may steal a romantic kiss on the water, catch a glimpse of a waterfall, or treat the kids to an adventurous afternoon. The Boathouse is open 9 a.m. to 5 p.m. every day of the week – ready to provide you with a vessel of your choosing. Before you leave, consider taking advantage of the Surrey Quadricycle photo op at the rental center. 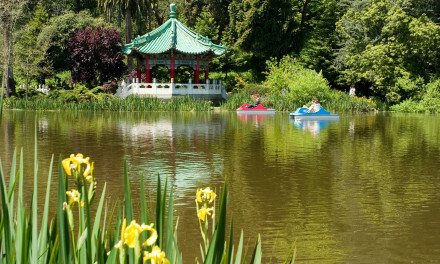 Bring your lunch and enjoy a picnic in the park while at Stow Lake. Offering eight picnic tables and two BBQ grills, some people also rent the picnic area for family celebrations, parties, and other gatherings. When nature calls, locate the Stow Lake restrooms situated close to the Boathouse. Hungry or thirsty? The onsite café at the Boathouse provides visitors with a cup of coffee, healthy snack, or tasty sandwich. The surrounding bridges, feathered residents, meandering turtles, and other bursts of nature create a wealth of photo opportunities – so don’t forget your camera. For some parents, bringing the kiddies to Golden Gate Park’s Stow Lake is a tradition. Children enjoy walking around the lake and crossing over the bridges to venture throughout Strawberry Hill, which is situated in the center of the lake. The more ambitious outings may include a visit to the historic Pioneer Log Cabin located near John F. Kennedy Drive. Other sights of Stow Lake include endless wildlife, many birds (some of which are on a serious prowl for their next meal), and the bright red colors of the round Chinese pagoda – a gift given to the park from San Francisco’s ‘sister city’ of Taipei. The more daring visitors of Stow Lake might want to stick around as dusk nears to investigate the legend of the White Lady, who is at the center of a more than 100-year ghost tale. Stow Lake is located between John F. Kennedy Drive and Martin Luther King Jr. Drive – west of the Japanese Tea Gardens. There are many staircases and paths that lead to the lake, including a stairway found on the path leaving the rear exit of the Japanese Tea Garden, as well as steps leading up from Martin Luther King Jr. Drive. Free parking is available along Stow Lake Drive. However, keep in mind that no cars are allowed on John F. Kennedy Drive on Saturdays (April to September) or Sundays (year-round) – access is only available then from Martin Luther King Jr. Drive.